Mercedes-Benz is preparing to launch a facelifted version of its fourth-generation C-Class as part of an extensive range of new and revised models in 2018. The reworked C-Class will lock horns with a new BMW 3 Series and upgraded Audi A4 in a renewed battle for executive class supremacy. It is set to make its premiere in saloon and estate body styles at the Geneva motor show in March, with coupé and cabriolet versions to follow at the New York motor show in April. All four are planned for UK deliveries from July. The C-Class will receive new-generation turbocharged 2.0-litre four-cylinder petrol and diesel engines – all with added performance and reduced emissions. The reworked model will also be offered with a number of hybrid powertrains in both mild and plug-in guises. The diesel models adopt Mercedes’ latest OM654-designated engine. 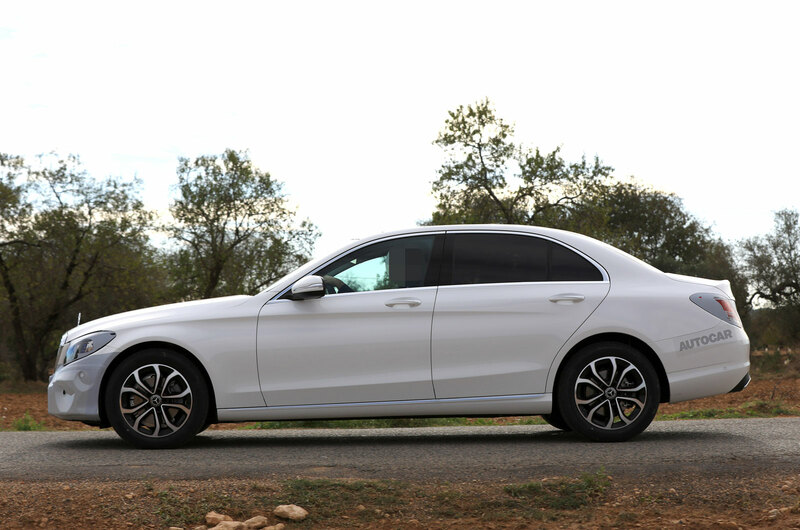 It develops 148bhp in the C200d, 192bhp in the C220d and 241bhp in the 300d, figures that represent increases of 13bhp, 24bhp and 40bhp over today’s models respectively. The petrol models feature Mercedes’ new M264 engine. In the new C200 EQ Boost, it develops an additional 7bhp over the old M274 engine, taking nominal reserves up to 188bhp. Additionally, it adopts a belt-driven alternator and 48V electric architecture that adds 17bhp for brief periods of electric boosting. The evolution of the M264 engine in the new C300 doesn’t use the hybrid functions of the C200 EQ Boost, but runs a higher state of tune with added turbo boost pressure. Power is up by 13bhp over today’s version of the C300, giving the updated model 255bhp. Autocar can also confirm plans for new petrol-electric C400 and diesel-electric C400d EQ Power hybrid models featuring plug-in capability and a pure electric driving range of up to 31 miles. Mercedes insiders reveal the advanced new C-Class models get updated electric motors featuring a 41bhp increase on the unit used by the existing C350e at 121bhp, together with new charging systems for faster charging times. Despite the appearance of a new turbocharged 2.9-litre in-line six-cylinder petrol in the new Mercedes-AMG E53 and CLS53 models, the facelifted C43 will retain the same turbocharged 3.0-litre V6 petrol unit used by today’s model, albeit with a mild increase in power. At the top of the line-up, the Mercedes-AMG C63 will also receive an updated version of the 4.0-litre V8 engine in use in the existing model, with new twin-scroll turbochargers. The new engines will be mated to a standard six-speed manual or new nine-speed torque converter-equipped automatic gearbox – the latter of which replaces the seven- speed automatic offered on today’s C-Class. Selected models, including the new C200 EQ Boost, will also get the option of Mercedes’ 4Matic four-wheel-drive system. 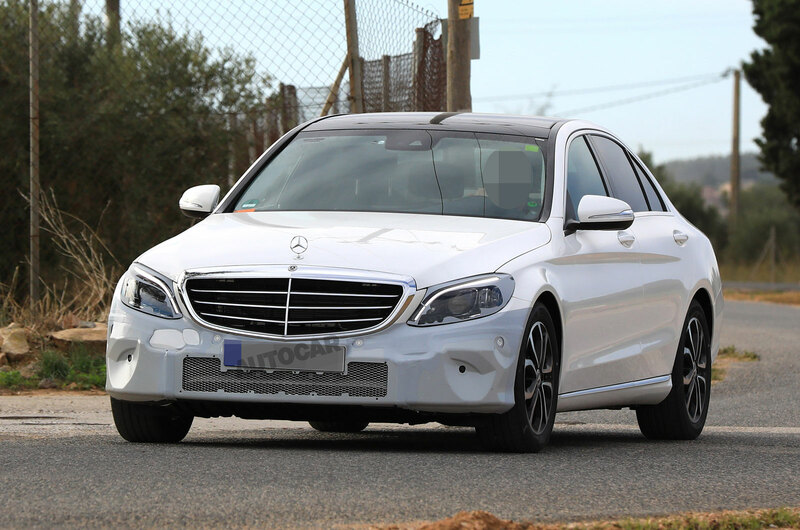 Prototype versions of the new Mercedes spied during recent testing reveal that styling changes are relatively minor. Key among them are reprofiled bumpers and a new diamond pattern grille insert for AMG models. The headlights have been reworked, with new Multibeam LED units offering the same optional Adaptive Highbeam Assist Plus function as on the E- and S-Class. The tail-lights receive new LED graphics. Mercedes has made more significant changes to the interior. Included are new high-definition digital instruments, a revised multi-function steering wheel with touch-control pads, a larger 10.25in free-standing infotainment display and a touchpad controller within a reworked centre console. The Comand infotainment system has been updated to the same Generation 5.5 standard as that used by the facelifted S-Class. The C-Class also gets an optional smartphone integration supporting Apple CarPlay, Android Auto and MirrorLink, as well as a wireless charging pad. Further changes to the interior include revised wood trim elements and a new range of optional seats, including ones with a massaging function. The adoption of a new electrical architecture has also brought Dynamic Body Control as part of an update to the C-Class’s optional Air Body Control air suspension and a Car-To-X capability that enables over-the-air software updates. Also included are a number of new driver assist systems, such as the latest evolution of Mercedes’ remote parking pilot and a Driving Assistance Package that includes Drive Pilot and Speed Limit Pilot. Good grief, such a design departure, I didn't recognise it.. I have just been out to look at my 2014 C220 Sport, apart from the headlights in your pictures nothing is different. Front bumper the same, chrome strips down the side all the same. The only thing I don't like about the C Class and most other current Mercedes is the oversized, cheap looking grill. Sadly that looks to be unchanged. Exactly! It makes it look like a poorly modified 190. Big badge grilles suit their sports cars, but I'm of the opinion that a Merc saloon should have the classy traditional chrome grille and bonnet ornament. you can spec that outside of the UK - the "exclusive" trim line in Germany has the traditional grill and star on the bonnet. Agree totally. If I was ordering a C-Class I’d prefer a traditional grill & 3 pointed gunsight. Come on Mercedes-Benz. You’ve been told. Agreed. I have driven behind a star for 20+ years and don't like the new grille. Also, Merc has restricted interior colours to mostly black on many models. So, I have looked at the competition and am now about to switch to BMW. So after they took some criticism for making the E too similar to the C and S, they decide to give the C the same headlights as the E. Huh. Also, pretty sure the engines won't all carryover, there's that brand new 2.0L diesel they just debuted on the E.